If you have completed an internal makeover, painted and put up decks, re-arranged the garden and made your home look amazing, then one day you’ll notice how “tired” the roof is. But you realise that the shape is wrong - it’s old, it’s uninteresting, it’s not “modern”. Perhaps you want an attic, perhaps you need Skylight - there are so many reasons to change your roof. 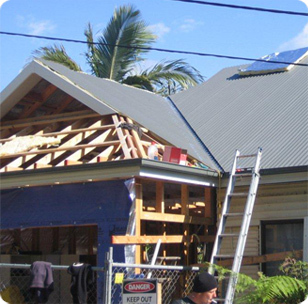 Tandem Trades are experts metal roofing contractors in Sydney specialising in Colorbond and Zincalume metal roofing and flashings We can work with a designer to create a modern roof, and quote the job realistically, so you aren’t paying too much. Tandem Trades specialise in metal roofing construction. We have 25 years of experience, and have install new metal roofs in every area of Sydney. Our installers are trained tradesmen who are extensively experienced in metal roofing. Tandem Trades is highly experience in metal roofing, and this allows us to give you the lowest quotes - we measure and estimate the roof very accurately, so there is almost no waste. With other companies who over estimate, you are still paying for the metal roof sheeting they waste. Whether it’s a new metal roof construction, roof repair, or metal re-roofing, just call us on 0439 417 147 for an obligation-free quote.